The Prescott Outdoor Classroom gained re-certification as a Nature Explore Classroom in August of 2014! Visit this site to learn more about how the space has grown over the past two years. The Prescott Outdoor Classroom transformed a gravel elementary school playground into a green space filled with grass, gardens, and areas for hands-on exploration. The Prescott team and the Nature Explore design team had the advantage of working with a very large space, which allowed ample room for each Nature Explore area. Students, staff, parents, and community members all provided input in the development of the outdoor classroom. 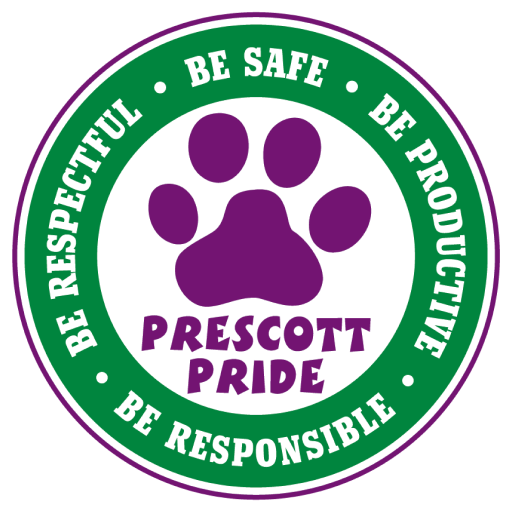 The skills of many members of the Prescott neighborhood were utilized, with Prescott parents, staff, students and the school-neighborhood advisory council assisting with fundraising and construction of key parts of the outdoor classroom. The storage, entry, bridge, stage, Who Walked Here? signs, gazebo, and raised beds were all constructed by teachers, community members and parents. Students took an active role in planting by attending weekend work days and by gardening with their classes or clubs and during Prescott family events. In addition, features such as the weather station were added to allow students to meet curriculum objectives in meaningful ways. In addition, the use of natural materials was a focus during construction and greatly added to the visual appeal and sen se of continuity in the space. The Prescott Outdoor Classroom includes the ten recommended Nature Explore areas, designed so that each area is distinct and that all areas can be seen at all times. This is important to allow students to consider all their possibilities and so that one teacher can supervise all areas at the same time. Each area in the outdoor classroom is clearly labeled with a Nature Explore area sign. These signs include the name of the area and a picture of the types of activities that could be done in the area. Cedar was used in construction whenever possible and the flagstone flooring, concrete walking path, and the large gathering stone are all very durable products. A bridge, designed over a rain garden, and an arbor, with a flagstone entry, designates the entry-ways into the outdoor classroom. Since the Prescott Outdoor Classroom is used by over five hundred students, a large grassy field, the Open Area, offers large groups of students the opportunity to run, play, explore, and engage in large-motor activities. A large section of a fallen tree is available for students to climb and crawl on with a balance beam and stumps found around the walking path. Stumps and tree cookies of varying sizes have been placed on a bed of sand and mulch which enable students to build and create on a large scale in the Messy Materials Area. Wood storage, near a flagstone floor, houses a variety of blocks and materials which make up the Building Area. The Nature Art Area was developed using two picnic tables in the center of the outdoor classroom which provide space for creating art inspired by this wonderful environment. The Music and Movement Area includes a stage and an inviting place for students to use the marimba, musical instruments and scarves. A circle of large rocks at the entrance and a shady gazebo provide inviting spots for students to gather. In addition to the open storage found in each area, a locked storage bin is located next to the gazebo and a storage shed is found in the corner of the outdoor classroom. L iving plants can be found throughout Prescott Outdoor Classroom. A figure-eight path winds through native wild flowers while bushes and shrubs create division between areas. Both raised and in-ground garden beds give students the opportunity to observe plants and the insects and animals that are drawn to them. Students have planted a wide variety of herbs and vegetables in the planting garden. The sensory garden is filled with plants to smell, touch, taste, and observe. Finally, fourth graders planted prairie grasses and painted a sign naming the area “Prescott Prairie”. These native plants were selected because they require relatively little maintenance and can withstand dry weather and high temperatures. The entire staff at Prescott Elementary attended a Nature Explore Workshop in Nebraska City at Arbor Day Farm, experiencing, first hand, techniques for using their outdoor classroom. Family involvement activities held recently included: Family Movie Night, with over 250 people in attendance; Prescott Park Family Fest, with approximately 250-300; Nature Night, a spring after-school event; Walkathon, including a day long adventure in the Outdoor Classroom, now an annual event with all grade levels, parents and community attending; Prescott Summer Festival, an annual event held in July, with approximately 350-400 people attending from the neighborhood which include not only Prescott families, but the entire community; Safe Walk To School, with 350-400 people; Kindergarten End-of-Year Recognition, with Parent/Child Exploration; the annual, all-school Field Day; and Family Learning Night, which is held 2 times a year with 200-300 parents and students attending. Prescott Park and Outdoor Classroom has developed into a wonderful space that enriches not only the school but the entire neighborhood and community. A map, photos and other information may be found at the Prescott website noted above.